Cellulose and cellulose synthetic blends have proven over time to be the best media value for most lube, fuel and air filter applications. New technology has allowed the development of cellulose-based media that provides the best combination of life and efficiency in various applications and operating conditions. Glass media was industrialized to be used in hydraulic systems, oil reclamation processes since it has low flow restriction at high filtration efficiencies and are not affected by water. 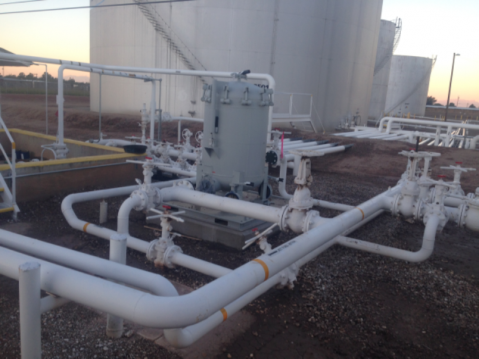 The benefits with glass media in hydraulics is when cold oil is being forced through the media and filtration in the 4-12 micron nominal range is desired. Glass media has a slight deficit regarding capacity. Usually, glass media has the same pore size and same fiber diameter through the entire sheet. The media can be manufactured to be very efficient, but then it is so tight that it offers little life or capacity. The media can be manufactured to be more open, but then efficiency is lost. Cellulose is manufactured with fibers of various sizes. On the top layer of the media (upstream), the fibers are fuzzy rather than flattened down. When fluid and contaminants pass through the cellulose, particles collect on the fuzzy fibers and don't move farther into the sheet. This is called "adsorption" because the particles adhere to the fibers. The more of this separation technique that a media applies, the more small particles can be separated before they reach the small pore spaces on the screen side (downstream) of the media. This action keeps these small particles from blinding off the media. This separation is known as "impingement." The more impingement media applies, the more particles are separated without blinding the tight pore space on the downstream side. Because cellulose media is better at adsorption and impingement, it can remove more contaminants than glass media without plugging pore spaces. For glass media to perform this way multiple layers have to be calendared/layered for capacity. The before and after photo shows the results of using our HENEK PC-736 cellulose elements. 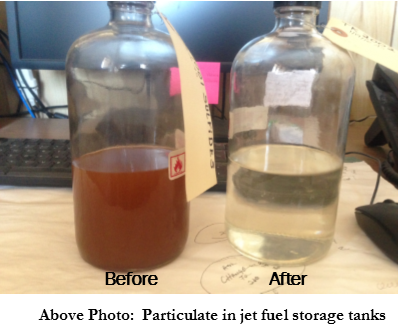 In this example, 358,680 gallons (8,540 barrels) of jet fuel, held in tanks, were processed through eighteen cellulose filters at 53,000 gallons per hour. Within 2-passes the Millipore™ spec was achieved. The average cost of a 36" cellulose can run $30.00 (each) compared to the average cost of $250 (each) for glass media; which is a significant price difference that saved our customer $3,960.00.The choice to use cellulose in the application was exceptional in cost and capacity. Allowable particulate weight for jet Fuel to be sold or shipped to destination is 1.0mg/liter, HENEK Manufacturing passed that goal in 2 passes and ended up at .0264mg/liter! Shown in front is Henek Manufacturing's vessel, used to filter JetA for pipeline transport. This terminal, located in southwest US, holds over 8500+ barrels . HENEK Manufacturing filters performed as expected. Only one filter change necessary to hit the spec to sell 352,800 gallons of off-spec fuel. Allowable particulate weight for jet Fuel to be sold or shipped to destination is 1.0mg/liter, HENEK Manufacturing achieved .0264mf/liter!